Offering an 8 week day camp for campers entering K-7th grade in the fall as well as 3 Drobot Camp weeks for students entering 3rd grade and older. The focus is always on the camper with the goal of fostering teamwork, cooperation, integrity, leadership skills, a sense of fair play, and a respect for self and others. These are skills that will last a lifetime! Archery skills are taught by our certified instructor and may include the famous Meadowbrook “Fruit Shoot”, “Halloween shoot” and other special events. Each camper has the opportunity to earn Archer Awards and pins. Safety is both taught and practiced! 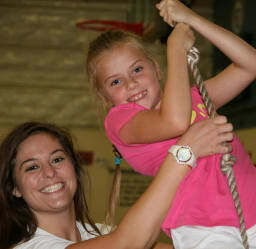 Campers explore their artistic abilities with this camp activity for campers grades K-7 . Arts & Crafts is taught by our Art Specialist who has been a Meadowbrook Day Camp counselor for many years. Campers create individual projects varying by their group levels and will bring projects home as completed. Soccer, baseball, basketball are all available to campers grades K-7. Concepts such as fair play, being a good teammate and specific skill instruction are all key to campers having fun with sports. Campers in grades 1-7 work outdoors, under the tent learning skills such as “slicking”, “stamping” and “lacing” to make their own individual keepsake projects. Our energetic and talented dance instructor teaches campers in all grades specific dance moves as well as exploring the fun of rhythms and movement. All campers are introduced to music through songs, chants, and drumming and will learn through this fun and active exploration into musical elements. 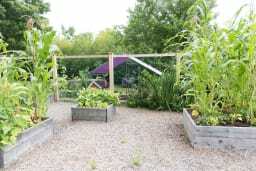 Nature is for campers K-7 and is taught in units such as pond, garden, woods and fields and includes such activities as learning to build a campfire, collecting the daily chicken eggs and exploring the wildlife that lives in our own Meadowbrook Pond. Our nature counselor, Margie is a teacher who experienced Meadowbrook as a camper when she was a child! Volcanoes, flight, goop, cars and more! What could be more fun than to incorporate learning with these hands-on experiments and activities? For campers entering grades K-7. All age groups get to channel their inner acting skills in weekly drama classes. Skits, improvisation and more! At Meadowbrook, campers in 3rd grade and older have a high ropes activity while younger campers use the traverse climbing wall and participate in group challenges. Campers at all grade levels use our camp canoes, row boats and “Playaks” to explore our pond. Safety is paramount and is taught by a certified lifeguard counselor. Campers enjoy paddling around our pond while in the company of their group counselors, always wearing a life jacket. All campers enjoy our two sparkling pools twice each day! In the morning, all campers experience a Red Cross Swim Lesson taught by our certified teachers. Afternoons are for “free swim” where campers beat the heat or practice their skills on their own while playing in the water with their friends. Read more about swim levels and certifications. Each camper in grades 1-7 has the opportunity to learn the basics or hone their tennis skills on our 4 beautiful courts. Coach Chris is our tennis pro who teaches children through adults in the non camp season and shares his true love of the game here at Meadowbrook each summer! 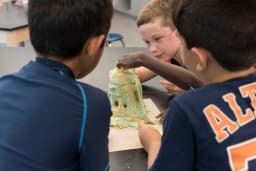 Campers in grades 2-7 create projects using various types of clay, some of which are then glazed and fired in our on campus kiln. 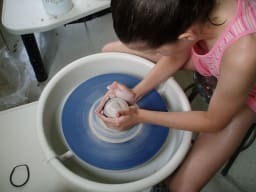 Projects may include colorful bowls, animal figures, beads or larger pots thrown on our pottery wheels.